"Barbecue using Innovative Culinary Technology"
Arrival will be Monday May 22nd and departure will be after the seminar concludes. Electrolux will book & pay for Flight, Hotel (1 night), Transportation and Meals while in Charlotte. 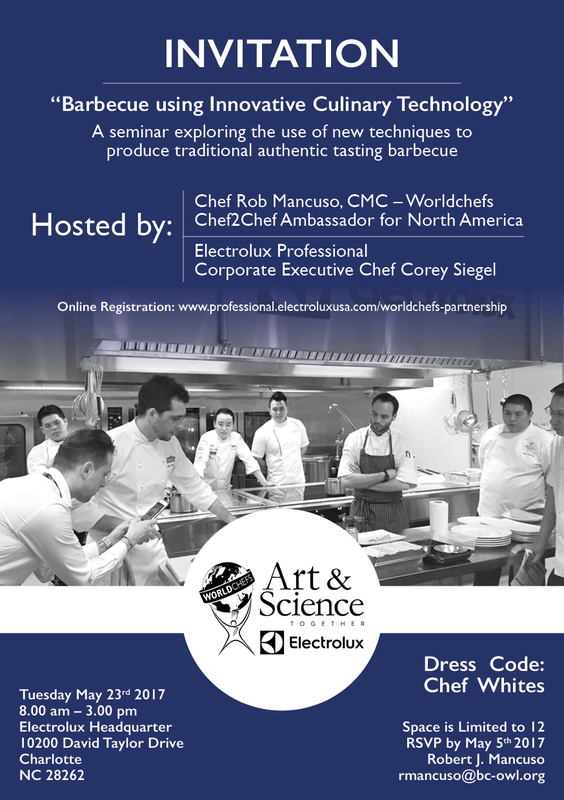 Electrolux Professional and WORLDCHEFS are pleased to invite you to a Chef2Chef training seminar as a part of their “Art & Science Come Together” alliance for 2017. These workshops will educate chefs on implementing sustainable practices in the kitchen while maintaining high standards. The chefs will serve quality food, balancing a mix of Electrolux innovative solutions and the chefs’ creativity. In this session, we will cover the execution of a full BBQ program while utilizing Cook & Chill technology (Combi Oven cooking and Blast Chilling techniques), Pressure Braising Pan and SpeeDelight high speed cooking methods. This hands-on experience will explore Smoked Meats and Fish, Familiar Side Dishes, Pickled Vegetables, Condiments, Rolls and more! Explain and demonstrate an understanding of the processes involved for cooking food using high productivity processes. Achieve a balance of nutritional value, texture, flavour and colour for food items that are prepared with an emphasis on healthy eating.